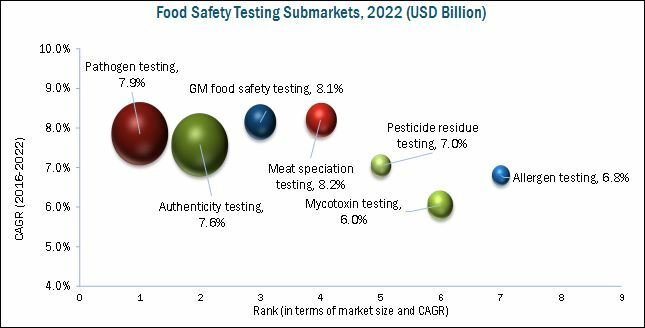 [335 Pages Report] The food safety testing and technologies market is projected to reach USD 39.47 Billion by 2022. It encompasses a variety of testing technologies market, among them the meat speciation testing market is projected to reach a value of USD 2.22 Billion by 2022, at the highest CAGR of 8.2% from 2016 to 2022, and bottled water testing equipment market is projected to reach a value of USD 6.80 Billion by 2022, at a CAGR of 5.3% from 2016 to 2022. The base year considered for the study is 2015, and the forecast period is from 2016 to 2022. The basic objective of the report is to understand the market by identifying various subsegments in the food safety testing and technologies market. This report includes estimations of the top 10 trends in the food safety testing and technologies industry in terms of value (USD million). 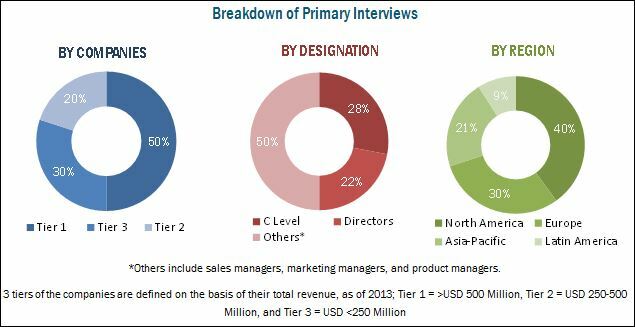 Both top-down and bottom-up approaches have been used to estimate and validate the size of the global food safety testing and technologies market and to estimate the size of various other dependent submarkets in the overall market. The key players in the market have been identified through secondary research, some of the sources are press releases, paid databases such as Factiva and Bloomberg, annual reports, and financial journals; their market share in respective regions has also been determined through primary and secondary research. All percentage shares, splits, and breakdowns have been determined using secondary sources and verified through primary sources. Key participants in the supply chain of the food safety testing and technologies market are the product manufacturers, end use industries, food and water safety policy regulators, and raw material suppliers. The key players that are profiled in the report include SGS S.A. (Switzerland), Bureau Veritas S.A. (France), Intertek Group plc (U.K.), Eurofins Scientific SE (Luxembourg), ALS Limited (Australia), Thermo Fisher Scientific Inc. (U.S.), Mérieux NutriSciences Corporation (U.S.), AsureQuality Ltd. (New Zealand), Microbac Laboratories Inc. (U.S.), and Romer Labs Diagnostic GmbH (Austria). The growth of the food safety testing market is estimated to be high in most regions. Increase in foodborne illness outbreaks, implementation of stringent food safety regulations globalization of food supply, and availability of advanced technology capable of rapid testing are the major driving factors of this market. On the other hand, lack of food control infrastructure & resources in developing countries, and lack of awareness about safety regulations among food manufacturers are major hindrances for the growth of the market, globally. Change in lifestyles, increase in demand for convenience foods, and increase in food trade and export and import across borders in emerging markets have been key opportunities for the food safety testing market. The global market for GM food safety testing is projected to exhibit a strong growth due to the current food shortage that the world is experiencing. Ensuring proper food and nutrient supply is the most important driver which is influencing the GM food safety testing market. GM food safety testing market is also rising due to the continuously evolving technologies used in agriculture that has resulted in a shift in farming practices. Growth in investment in the research and development of genetically modified products is another driver leading the market. The water safety testing & analysis market is projected to grow at a rapid pace due to stringent hygiene standards, mandatory need for pure drinking and utility water, and increase in government and private funding for tackling environmental issues. All government and private sectors across the globe are stressing on the innovation process for increasing the efficiency of water safety testing and providing incentives, financial support, advisory services, and facilities for water testing and analysis to improve and maintain the water quality for human consumption. The major restraining factors that affect the top 10 trends in the food safety testing and technologies industry are lack of food control infrastructure & resources in developing countries and lack of awareness about safety regulations among food manufacturers. Thus, companies must be proactive and carry out food safety testing to avoid contamination. As food contamination is most likely to take place in the supply chain from production to consumption, risks can be identified by inspecting the backward flow of the supply chain. SGS S.A. (Switzerland), Bureau Veritas S.A. (France), and Intertek Group plc (U.K.) are some of the prominent players in the top 10 trends in food safety testing and technologies industry; these companies focused on expanding their product manufacturing capacities, to cater to the large customer base to develop new products. 7.2.2.3.1 Emerging Markets in Asian, African, and Other Countries. 15.7 Thermo Fisher Scientific, Inc.